A darker tale than it seems. Bobby, Eddy and David were triplets, born in New York in 1961 to a single mother who gave them up for adoption. The boys were then separated and placed into families of varying economic and social strata, and it wouldn't be another 19 years until any of them realized the others even existed. And the story gets crazier — much crazier — from there. 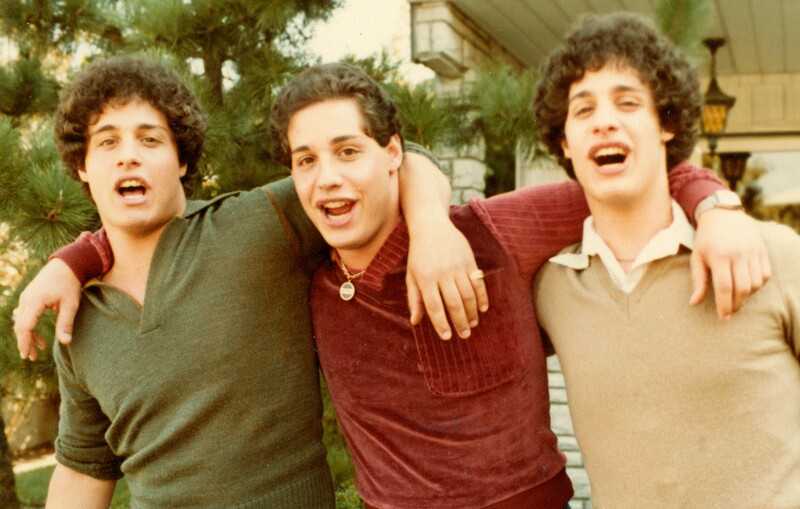 Three Identical Strangers is one of those stranger-than-fiction documentaries we seem to be getting an awful lot of, detailing a case that takes the sort of sharp, unexpected turns that only nonfiction can. What a fascinating and unpredictable tale it is, a heartwarming human interest story that unexpectedly and implacably descends into the realm of horror. It feels a bit ridiculous to issue a spoiler warning for true events, but the less you know about this case, the better. And sure enough, David was the third brother. "They're coming out of the woodwork," one of the adoptive mothers is recalled as saying. The similarities between the guys started stacking up. They all grew up within a 100-mile radius of one another. They smoked the same brand of cigarettes. They had the same taste in women. They were all on their respective high school wrestling teams. Their speech patterns, hand movements, senses of humor — it's as if they were clones, not brothers. It's no wonder, then, that the men became fixtures of the early '80s talk show circuit, wearing matching outfits and finishing each other's sentences, much to the delight of the Donahue audience. They become instantly and impossibly close, moving into an apartment together and indulging in all the prurient benefits that come with sudden celebrity, partying at Studio 54 and cameoing alongside Madonna in the New York punk comedy Desperately Seeking Susan. Later on, they'd open a restaurant called Triplets, working the front of the house and selling T-shirts emblazoned with caricatures of their faces. But the joy of reunification didn't last, and the questions surrounding the brothers' backgrounds started nagging at them. How would their lives be different if they'd grown up together? Why did the adoption agency knowingly separate them, and why were they kept in the dark about the other twins? And why, after the triplets' adoptive parents confronted said agency about its transgressions, did the higher-ups pop a celebratory bottle of champagne as if they'd dodged a bullet? I'm not going to detail what happened next (if you're really curious, a quick Google search can do that for you), because I think it's best to allow the movie to absorb you in its increasingly startling revelations. They're far more outlandish than you could imagine. Three Identical Strangers is the first theatrical feature by British documentarian Tim Wardle, and he has structured it like those Dateline mysteries you can't turn away from. There's even a montage in which a series of seemingly unimportant details and tossed-off observations come rushing back at us in rapid-fire succession, but this time they've been recontextualized in new, uncomfortable ways. The movie unfolds with a wild unpredictability that soon gives way to a sinking, depressing inevitability. There are aspects of this weird saga, however, that aren't explored sufficiently. I wanted to know more about the brothers' wives and kids, and how they reacted as the secrets of their husbands' backgrounds came to light. Details of their respective childhoods are also a bit sketchy, and a third-act discussion of their shared mental health issues feels frustratingly superficial. And in one of the film's most bizarre side steps, we learn that one of the triplets was briefly implicated in a murder, and yet it's brushed away as if that sort of thing happens all the time. The original print version of this article was headlined "Brothers' Blues"
Three Identical Strangers is not showing in any theaters in the area.